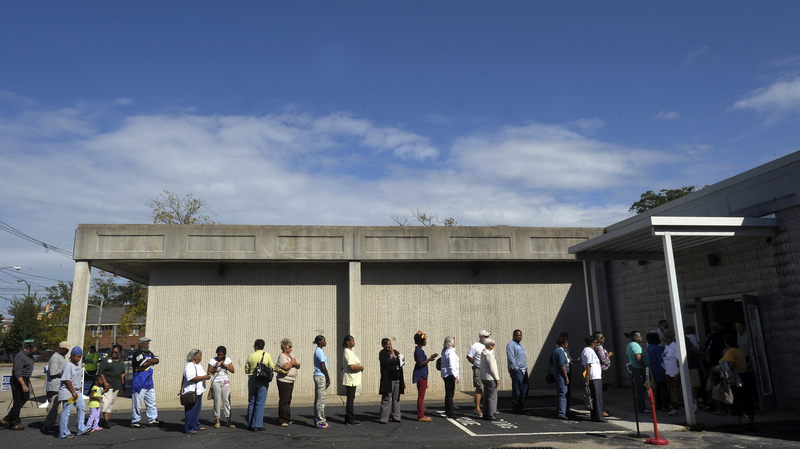 People wait in line to vote at the Board of Elections early voting site on Oct. 18, 2012, in Wilson, N.C. The U.S. Justice Department and several groups are suing North Carolina over the sweeping election overhaul it passed two years ago. A federal trial in Winston-Salem, N.C., that begins Monday will have big implications for voting rights in the state and, potentially, across the country. The U.S. Justice Department and several groups are suing North Carolina over the sweeping election overhaul it passed two years ago, which narrowed the early voting period, among other provisions. That early voting window had resulted in a noticeable uptick in the number of minority voters. For decades in the state, black voter turnout lagged far behind white turnout. Then, in 2000, state lawmakers opened up an early voting period. In 2005, they said voters could cast ballots outside their assigned precinct. And in 2007, they enabled same-day registration. After those changes, attorney Allison Riggs says, black voter registration and turnout surged. "They had their intended effect of evening the playing field in the state, and the Legislature yanked that away," she says. Riggs represents the League of Women Voters, one of the groups that sued North Carolina after Republican lawmakers changed those policies two years ago. The overhaul requires voters to show government-issued ID. It eliminates out-of-precinct voting and same-day registration. Then-U.S. Attorney General Eric Holder highlighted another change when the Justice Department announced that it, too, was suing. "It is especially troubling that the law would significantly narrow the early voting window that enabled hundreds of thousands of North Carolinians, including a disproportionately large number of minority voters, to cast ballots," he said. In the past two presidential elections, about 70 percent of black voters cast their votes early. That compares with about 50 percent of white voters. The 2013 overhaul cut the early voting period by seven days, although it requires most counties to still offer the same total hours of early voting as they did before. Attorney Chris Brook of the North Carolina ACLU says that overall, "the measures that were passed here in North Carolina are among the most restrictive, if not the most restrictive, in the nation." Republican legislatures in Wisconsin, Ohio and Texas, for example, have passed some combination of what North Carolina did, but not altogether. Partisan politics are certainly playing a role. North Carolina has been up for grabs the past few elections, and the changes in the state disproportionately affect Democrats as well as blacks. Brook says this case "will go a long way to deciding whether measures along these lines are going to be upheld in other portions of the nation." What's going on in other states is actually a key part of North Carolina's defense of the law. The state's lawyers point out that Virginia doesn't have any early voting, and yet it, too, experienced surges in black turnout the past two presidential elections. In a previous court hearing, Thomas Farr, an attorney representing North Carolina, emphasized that the election overhaul, as it's written, makes zero changes based on race. "How can there be unequal opportunity when all voters have the right to register 25 days before the election? The statute itself is facially neutral," he says. But it's likely that what this case will come down to is whether the effect is neutral. The trial will not settle the challenge against voter ID. North Carolina lawmakers watered down the ID requirement last month, and the judge is giving attorneys more time to sort out how that affects their case.